Christina Collins: We are gonna' have a ball! We are gonna' have a ball! The weather has been so nice lately. I am hoping it doesn't decide to get cold again. I took Charlotte outside to play with her ball and explore. She loved every minute of it! This will be the first year that she is actually able to play on the playground, go to the beach, etc. Last year she was a little to young. I am really looking forward to these experiences with her. I snapped some really cute photos and decided to scrap them right away. The grid paper, the teal polka dot paper, and the doily border are from Simple Stories' Fabulous collection. 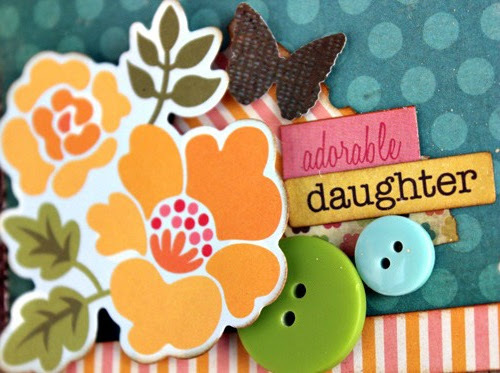 The pink/orange striped paper is from American Crafts' Dear Lizzy Neapolitan collection. The yellow piece (with the numbers on it) is from Crate Paper's Neighborhood collection. I punched it with my EK Success Binding Edge punch. The little brown butterflies were punched out using my Martha Stewart 3 in 1 Butterfly punch. The card stock flowers (which I am in love with) are from My Little Shoebox's Enchanted Garden Collection. The buttons are from October Afternoon's Sidewalks collection (I've become a bit button crazed). The various word stickers and alpha stickers are from My Minds Eye, Bo Bunny, and a couple of the companies I already mentioned. this is beautiful! Love all the colors! This is SUCH a pretty layout! I love it! Great layout!! Love the colors! And the pictures of your daughter playing with the ball are adorable!! Great design! The colors and photographs are fantastic! She is such a cutie! I totally live this! Great design and fab colors! Hi Christina! This is a beautiful and bright layout. You did a wonderful job on this. I enjoyed looking through your blog tonight and seeing your awesome creations. If you don't mind, I would like your permission to follow your blog, and I'd also like to invite you to stop by my blog, take a peek, and become a new follower on my blog as well. I'd really LOVE to have you. Stop by when you can, and let me know if I can do the same here.